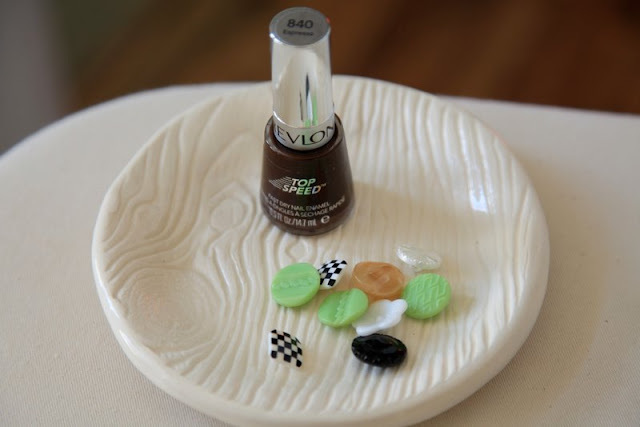 I looked for an enamel paint to paint my buttons, but found that Revlon Espresso 840 nailpolish was the perfect shade for chocolate. It covers really well, and most my buttons just needed one coat. 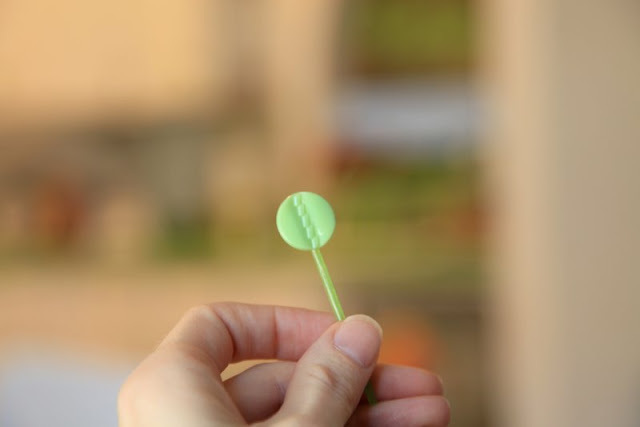 It makes it easier to paint both the top and sides at the same time if you hold it stuck on a toothpick, blow on it a little bit before setting it down, preferably on a plastic surface, not paper towel. For the decorating I used a red shade of nailpolish and the end of a toothpick to paint the detail work. I also added some red, very fine glitter on some of them. 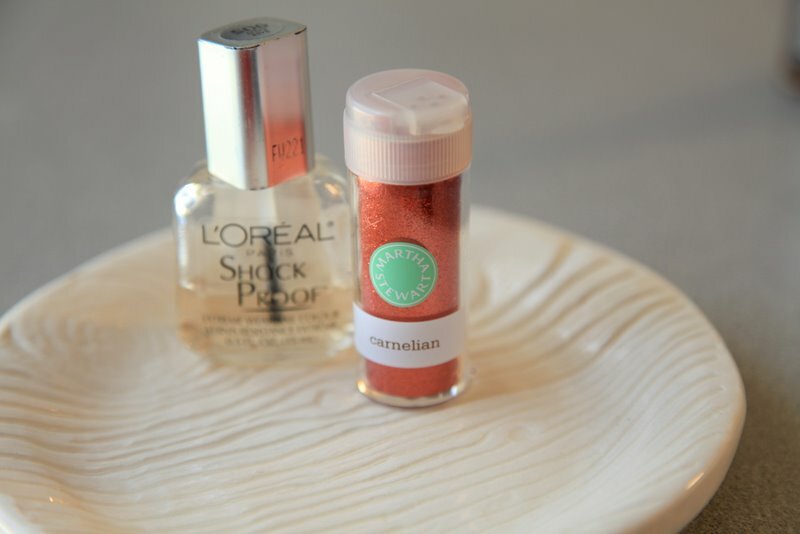 Add some clear nailpolish where you want the glitter to stick and then apply glitter. After that coat dries, add another coat of the clear to keep those sparkles in place! 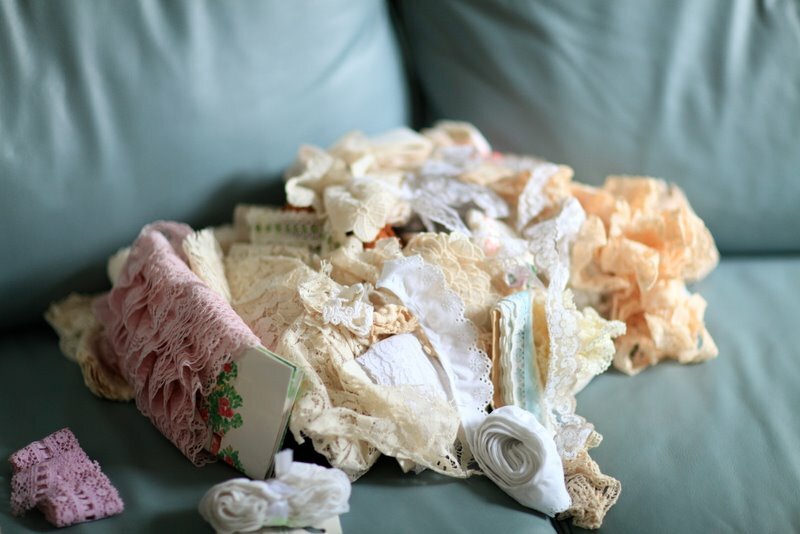 This is the story of a mound of lace who was in need of a bigger purpose than a simple strand of trim. Prewash and iron your lace. Lay every single pattern piece out, so you may need to cut an additional sleeve, or bodice piece if you are using a commercial pattern [if it says: CUT 2, then go ahead and cut an additional piece.] If the pattern piece says CUT ON FOLD, trace out both sides so you have a single, entire piece. Mine is an original pattern, but you can really do most any pattern you like using this technique. 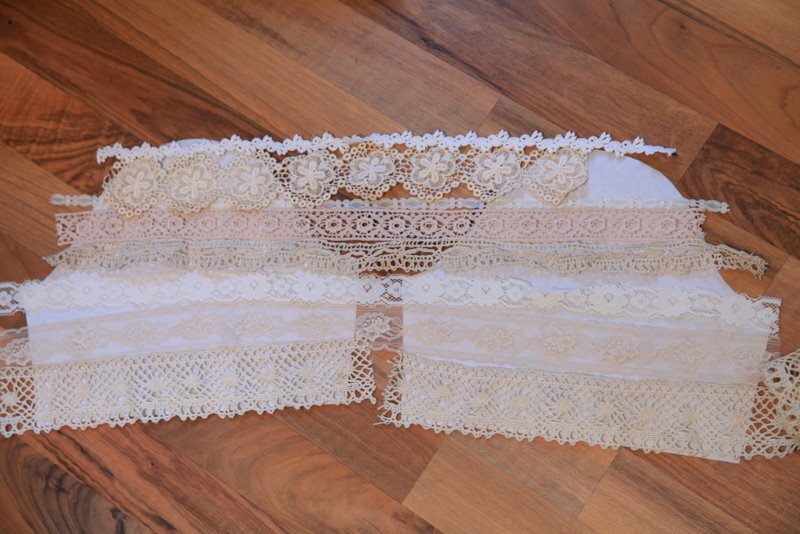 Lay your lace on top of your pieces, lined up, so they will match at the seams when you get it sewn together. Figure out how you want to arrange your laces, but don't start cutting yet. Overlap the lace with the next one just a little bit. 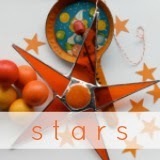 You may want to add one more at the bottom, just in case you sew them together more overlapped than you lay them out. Make sure you have enough of each lace trim for all of your pieces. I miscalculated on one of my strands and had to substitute another piece, but you don't want to risk it! Next, cut your lace and inch larger than your pattern pieces. Give yourself a little wiggle room in case of shrinkage or lace that likes to maneuver. Put a piece of double stick tape down the entire piece of each pattern and press your lace in place, so you can transfer it next to your sewing machine without them all falling out of place. Remove one piece of lace at a time from the pattern piece, and use a slight zig zag stitch, with your lace overlapped enough that your stitches are catching both pieces as you go. Use a thread that is close to the color you are dying your lace. Repeat with each piece of lace. 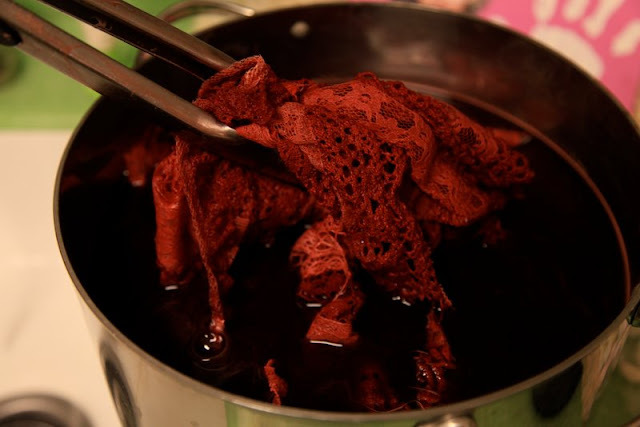 Get your lace wet, and prepare the dye bath. I just do mine on the stove in a large pot. Experiment with a scrap before you put all that lace in. It's quite exhilarating! Include any other piece you might add to the dress: I dyed single pieces of lace that I was adding to the sleeves and around the neck. Follow the instructions on the dye package. Adding salt helps the fabric to absorb and keep the color. 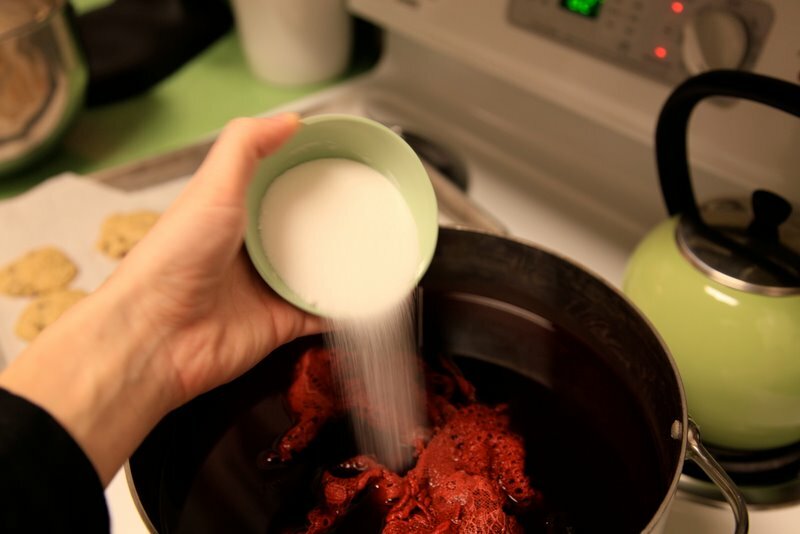 The lace will be lighter than what it appears in the dye solution, so dye it darker than you think you want it. 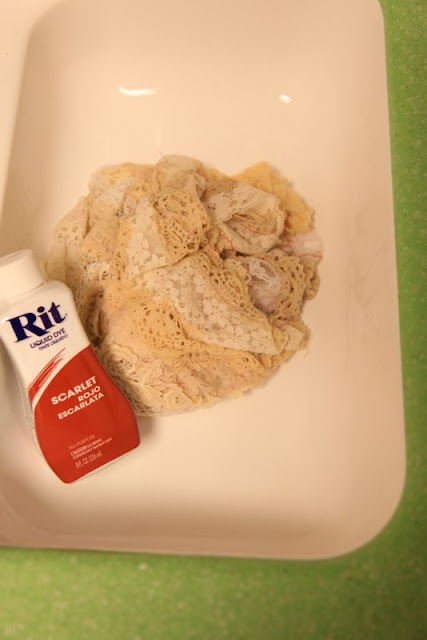 Rinse the lace in hot water until the water runs clear. I admit I rinsed and rinsed and rinsed and it was always a pale pink. 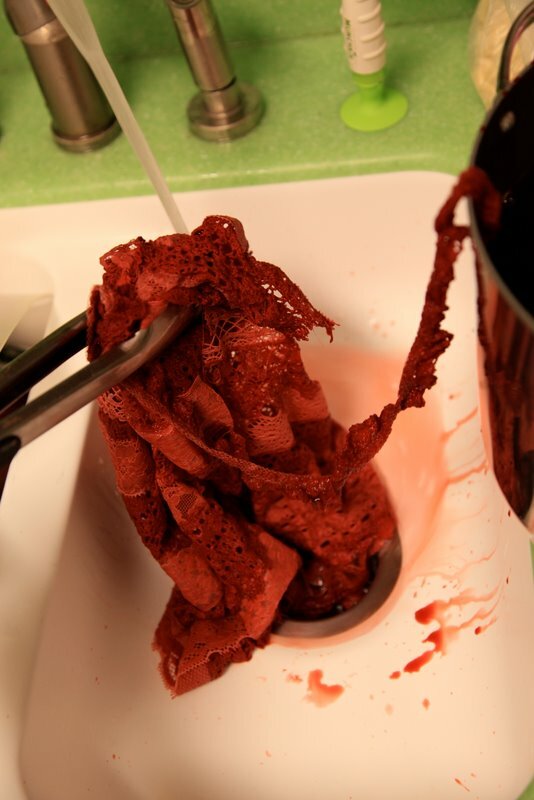 So I would suggest when you wash the garment after you complete it, to wash it alone, in case of color transfer. 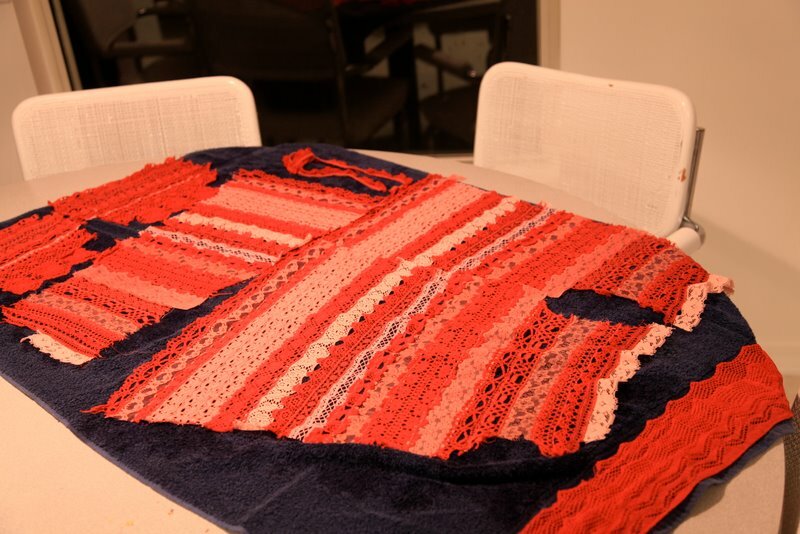 I laid my lace out on a towel to dry and shape. 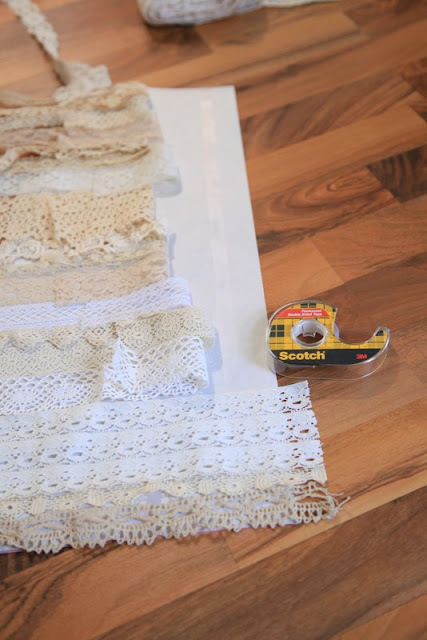 Next cut your lace exactly to the size of the pattern, along with lining. 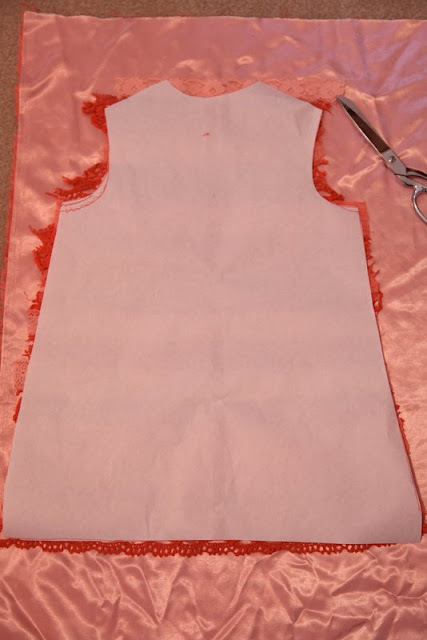 I originally dyed and cut this lining, but it was too pale, so I actually used some red silk to line it instead. One other hint I don't have a picture of is I added some sturdy ribbon to the back of each side of the placket. This helped with the stability of the buttonholes and the buttons. You can't use interfacing since it will show. No arsenic here, just old lace! I love dying fabric. I dyed my drapes and other upholestry material. I have found that material tends to ravel out when I dye it. Did you notice that with the lace? !!!!! like, 4 kinds of awesome, at LEAST! I missed the original post, but luckily came across this one. So lovely... thanks for the inspiration. 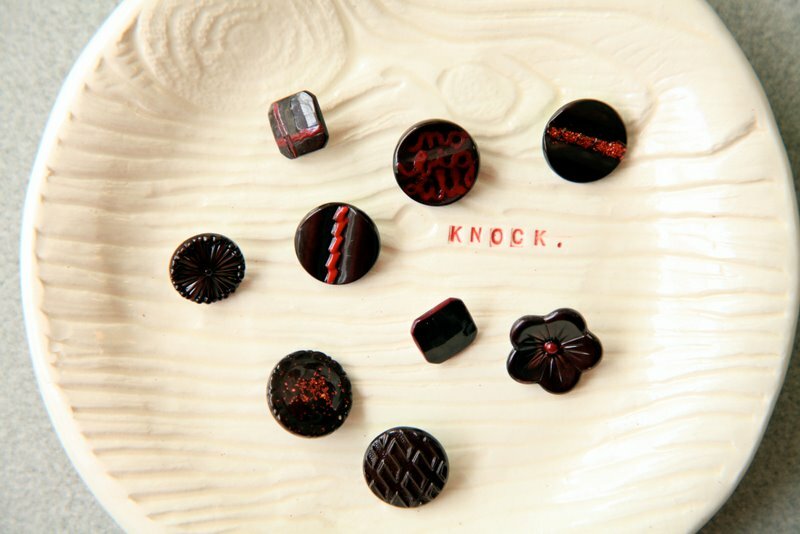 Also using fingernail polish to paint buttons??? brilliant! Love your lace looks. Also pretty neat that the same sink is used for the lace as baby boy gets a bath in. I love this dress. I have a stash full of lace my mom gave to me. She is a craft/sewing supply hoarder. I think I really ought to give this a try. Thanks for inspiring me! LOVE IT! Thanks for the salt tip- I didn't know that! OMG I love that movie! 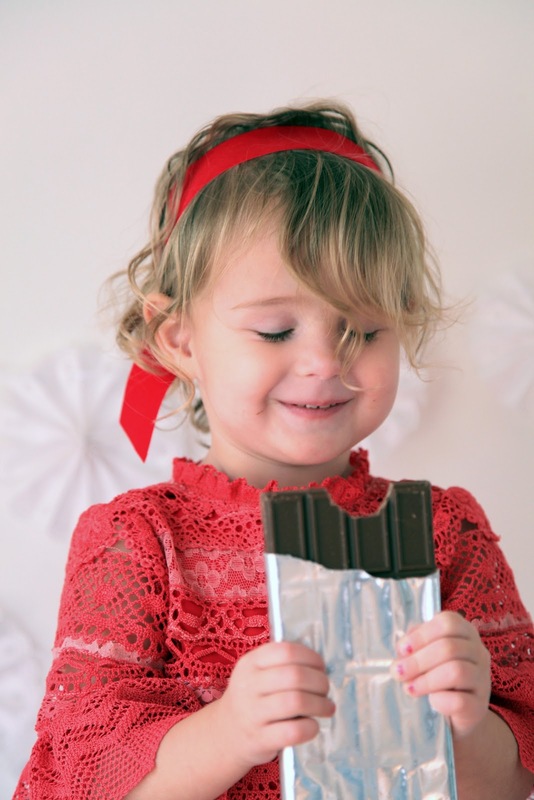 Cute tute. I am going to try this tomorrow on a skirt for me. My two questions are: if you only have tape on the two sides how do you keep the lace from getting tangled while you are stitching them together? And do you sew through the tape? Quilting Maven--I should clarify. You don't sew the lace onto your pattern pieces. The tape is just to design where you want each piece of lace. 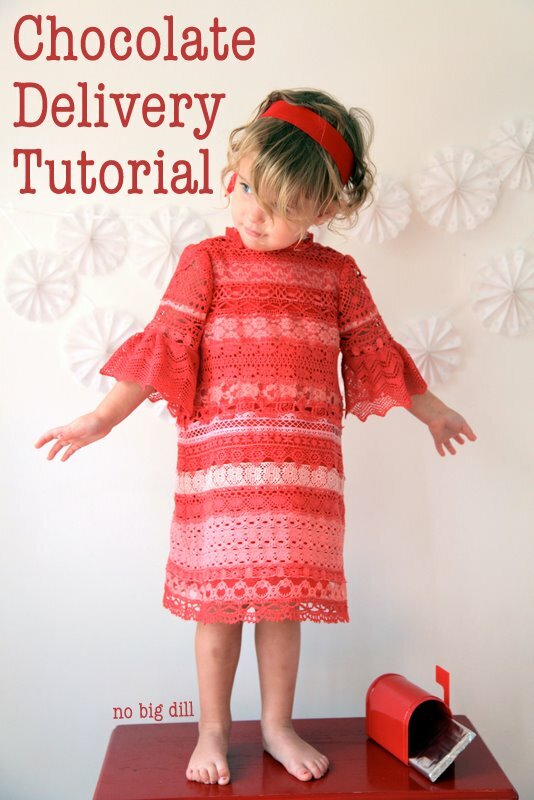 Take the entire pattern piece by your sewing machine and remove one piece of lace at a time from the pattern piece, stitching them together, slightly overlapped, with a slight zig-zag stitch. Then add the next piece of lace using the same method.